Woven re-purposed tower material, graphics shows our participant breakdown in Allegheny County. The cold is nearly gone and all winter long we’ve been reflecting on our experiences with Knit the Bridge. 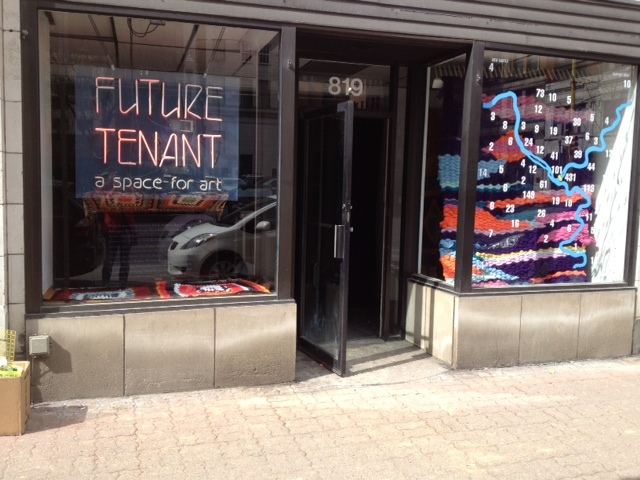 We’re super excited to be hosted by Future Tenant tomorrow night for a discussion about the project and its impact. Everyone is welcome to attend, tomorrow evening, Saturday, April 12th from 6:30-8:30pm, 819 Penn Ave, Downtown. Bring your needles and hooks. Listen in. Participate. And enjoy. Be sure to check out our window installation which includes a video loop by Annette Sandberg, graphics by Martha Wasik, and re-purposed tower material from Contemporary Craft’s Out of Hand Gala. Thanks to all the KtB crew who helped make the installation and event happen! See you at Future Tenant tomorrow!